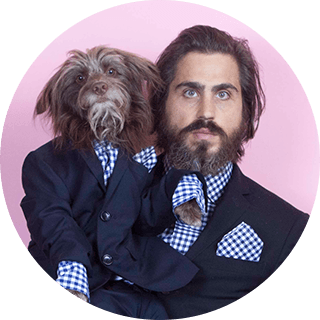 Topher Brophy is a New York-based Dog Dad artist who has gained international attention due to the socially conscious and wildly imaginative photos of him and his son, Rosenberg The Dog, in elaborate matching outfits. Before he became a father, Topher had been going through a difficult time. He came to realize his emotional void was caused by a desire to care for someone else, which is when he adopted Rosenberg, who unknowingly, bore an uncanny physical resemblance to him. Topher and Rosenberg have dedicated their newfound attention to spreading positive messages and promoting organizations that perpetuate compassion, tolerance, and sustainability. In partnership with their photographer and creative director, The Dog Styler, they are steadfastly dedicated to their art, and use it as a portal to uplift as many people as humanly possible. I enjoy advanced brain games and cross my paws when engrossed in deep conversation. I love chewing carrots and smelling pizza, but you’ll never catch me eating them. At times I’m extremely shy, but once I warm up to you, I’ll be your friend for life. I don’t believe in monogamy. At the moment I have two girlfriends and a boyfriend. I’m a trained actor, specializing in sense memory techniques. My idols are Ghandi, Mother Theresa, Mister Rogers & Winnie The Pooh. I believe that insects should have the same rights as people. I attend bi-weeky decoupage classes at my local YMCA. As a teenager, I founded a mushroom hunting association in upstate New York. I’m classified as an elite dressage rider by the The United States Equestrian Federation.